Wayne State University Press, 9780814334690, 166pp. Experts estimate that perhaps forty square miles of Detroit are vacant-from a quarter to a third of the city -a level of emptiness that creates a landscape unlike any other big city. 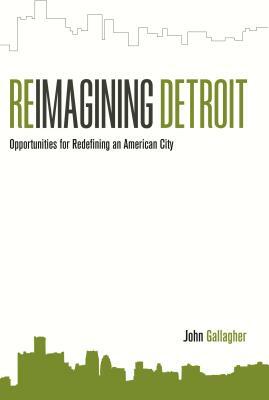 Author John Gallagher, who has covered urban redevelopment for the Detroit Free Press for two decades, spent a year researching what is going on in Detroit precisely because of its open space and the dire economic times we face. Instead of presenting another account of the city's decline, Reimagining Detroit: Opportunities for Redefining an American City showcases the innovative community-building work happening in the city and focuses on what else can be done to make Detroit leaner, greener, and more economically self-sufficient. Gallagher conducted numerous interviews, visited community projects, and took many of the photographs that accompany the text to uncover some of the strategies that are being used, and could be used in the future, to make twenty-first century Detroit a more sustainable and desirable place to live. Some of the topics Gallagher discusses are urban agriculture, restoring vacant lots, reconfiguring Detroit's overbuilt road network, and reestablishing some of the city's original natural landscape. He also investigates new models for governing the city and fostering a more entrepreneurial economy to ensure a more stable political and economic future. Along the way, Gallagher introduces readers to innovative projects that are already under way in the city and proposes other models for possible solutions-from as far away as Dresden, Germany, and Seoul, South Korea, and as close to home as Philadelphia and Youngstown-to complement current efforts. Ultimately, Gallagher helps to promote progressive ideas and the community leaders advancing them and offers guidance for other places dealing with the shrinking cities phenomenon. Readers interested in urban studies and environmental issues will enjoy the fresh perspective of Reimagining Detroit. John Gallagher is a veteran journalist who writes about urban and economic development for the Detroit Free Press. He joined the newspaper in 1987. John's other books include Great Architecture of Michigan and, as co-author, AIA Detroit: The American Institute of Architects Guide to Detroit Architecture.